This was The Little Theatre's 16th Christmas Pantomime in as many years! The December 2010 shows were a tribute to the memory of Mitheran Devanesan. The show on Thursday December 16, 2010 was for 500 underprivileged children. After this the doors opened to the public. We sold out all the shows! But still people came to the theatre and paid to sit on the aisle steps! We have a tradition of never turning away anyone who come to our shows! Jayraj Rau has worked managing the house to an art..... and magically everyone as usual was happy and seated! The cast under the able direction of veteran theatre actor / director Hans Kaushik gave 8 tremendous performances. Like every year, Ayesha Rau and her Little Theatre, were back again with their Christmas treat for Chennai kids. As is the tradition, Little Theatre stages a pantomime during the festive season. Ayesha Rau founded the ‘Little Theatre’ way back in 1991 with an aim of tapping and enhancing the creative potential of children. Her workshops include dance, mime, puppetry, craft and magic, and the grand finale every year is when the children get to take part in the annual pantomime. This year’s Christmas surprise was a well-orchestrated pantomime titled ‘Rip Van Wrinkle’ starring around 60 little members of the group. The performance professed to bring out the child in you, and hoped to be a hit with kids, proud parents and adults alike. 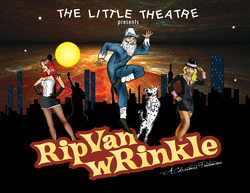 The story of Rip Van Winkle may be age old, but Little Theatre presented it with a slight twist. The adventures of Rip Van Winkle and his silly dog, Wolf, begin amidst frolicking and prancing in the Dutch mountains. The story then weaves its way to modern day New York where little Wolf gets lost in the big apple, and Rip Van Winkle gets embroiled with the mafia and falls prey to street fights and intrigue. The underlying current of several love stories is deftly woven into the single-minded mission of finding little Wolf. Songs, dances and slapstick follow….